Who the heck puts this all together? When is the next Bout of Books? What is CATPCHA? How do I know if I have it on? Can I participate if I don't have a blog or Twitter account? Can I participate in the read-a-thon if I don't want to participate in the giveaways, challenges, or Twitter chats? Can I change my goals? Can my sign up post and goal post be the same? How do the daily link ups work? Should I have one post that I update daily or have a new post every day? Can I read books that aren't my list? What does "actively participating" in the read-a-thon mean? How do I link to a specific tweet on Twitter? How do I follow the #boutofbooks hashtag? Where is the #boutofbooks TweetChat room? What's the difference between @boutofbooks and #boutofbooks? 1. I'm new to the read-a-thon, and am not really sure what to do. Where do I go for information? Check the about page, the getting started page, this page, as well as the current sign up post. If they do not answer your questions, then please contact the team by using the contact options in the sidebar. 2. Who the heck puts all this together? While Amanda is the Dark Overlord (and ultimately makes the final decisions on all things), the Bout of Books team also consists of Kelly Rubidoux Apple, Amanda's brain-sharing, shenanigan-causing partner in crime! We are also helped out by a slew of dedicated Bout of Books experts (scroll down, they're at the bottom-ish!) who would love to answer your questions! 3. When is the next Bout of Books? Dates for the next Bout of Books, as well as the three after that, are located on the about page. 4. Why aren't there more international/CA giveaways? All giveaway and challenge hosts are volunteers, and they are almost always paying out of their own pocket. We try to make sure the majority of giveaways are open to our international participants, but sometimes it's just not possible. 5. What is CAPTCHA? How do I know if I have it on? 1. I don't have a blog (or Twitter account or Facebook or Goodreads), can I still participate? Yes! We only require that you update somewhere publicly. (Meaning anyone--like your challenge hosts--can see that you're participating without logging in to anything.) Even if you have none of these, you can leave your updates in the comment section of this blog. 2. I don't want to participate in the giveaways/challenges/Twitter chats, can I still participate in the read-a-thon? YES! All giveaways and challenges are optional. This is a read-a-thon. The only thing you actually need to do is read. As for Twitter, we understand that not everyone is a fan, and so it can be used however best works for YOU. 3. Ms. X and I run a blog together, but we both want to sign up. Do we sign up individually or together? If the only updates are on the blog, sign up together. If you intend to update from your personal Twitter and/or Goodreads account, sign up individually. 4. Do audiobooks count for the read-a-thon? How do I track my progress with them? Absolutely! Reading can be a whole body experience. You can track audiobooks multiple ways: by discs, by chapters, or by how many hours you've listened to. 5. The goals I originally picked aren't working for me. Can I change them? Please do! As a reminder, goals are completely optional. If having goals helps keep you motivated, set some. Ultimately, this read-a-thon is here to help motivate you. The goals you choose can be amended, altered, tailored, and otherwise changed to suit you. If you don't like the books you originally picked out, change them! If you were overly ambitious in the number of books you thought you'd be able to read, change it! Some people choose not to have a list of books to choose from. That's fine! Some people add to their original list as the read-a-thon progresses. That's fine, too! This is your read-a-thon, make it work for you! 6. Can my sign up post and goal post be the same? Yes, absolutely! If you prefer a more low-pressure approach, feel free to try our read-a-thon goal-less. Seriously, it's whatever works best for you. Is it okay if I have one [daily recap] post that I update daily or should I have a new one for each day? This is entirely up to you. There is no right or wrong way to track your reading throughout the readathon. We have provided a basic template in the Goals Post Template section that you can tweak to your heart's content. One of the links on the update linky is broken. What should I do? If it’s your link, please fix it. The inlinkz linky is set up so that you can delete your own link (and re-add it). If it’s someone else’s, do let them know so they can fix it. Yes, absolutely! It's whatever works best for you. While you are required to sign up by declaring your intention to join, we no longer require a goals post to be considered actively participating. Again, however you want to swing this works for us! 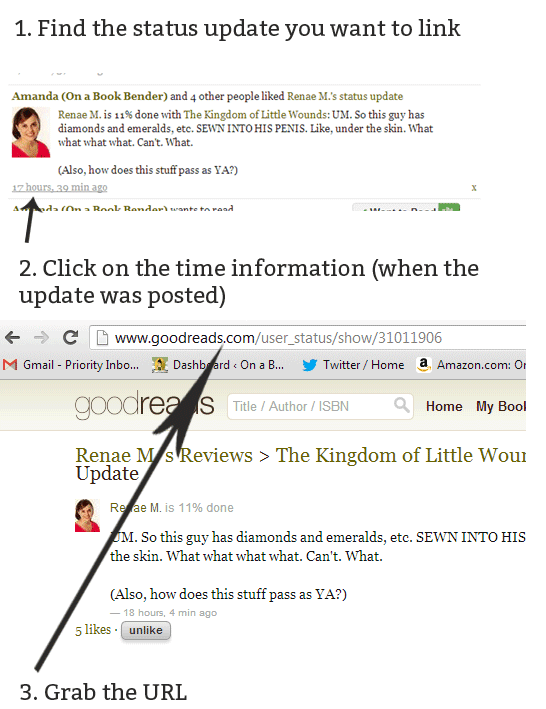 How do I link up Goodreads status updates? The following is a basic template you can use for your goals. Alter it, add to it, mix things up. However, if you do use it, a link back to us so that others can find it would be greatly appreciated. I will be reading a day/on the weekend/all week. Can I read books that aren't on my list? Of course! Read whatever you want. I'd like to win the Grand Prize. What does "actively participating" in the read-a-thon mean? At least two updates that show reading progress that are DIRECTLY linked in one of our daily link ups. One of the ways that Bout of Books readers can stay in the loop is through Twitter. This section is here to offer suggestions for improving your Bout of Books Twitter experience. Where can I get important updates on Twitter? Follow our official Twitter account, @boutofbooks, or follow the hashtag #boutofbooks. You can find it at tweetchat.com/room/boutofbooks. 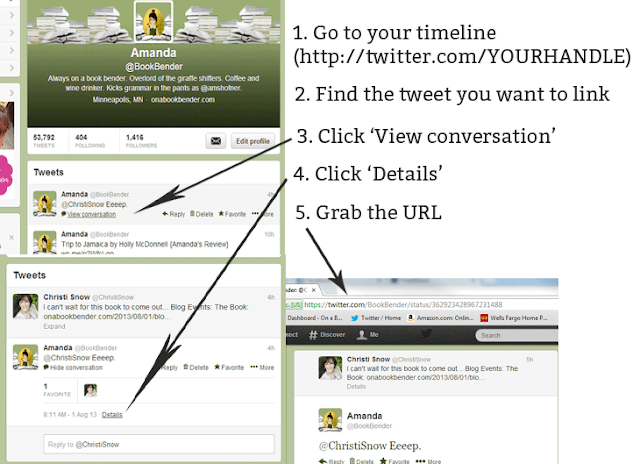 @boutofbooks is the Twitter account Amanda and Kelly use to share important updates and interact with readers. #boutofbooks is our official hashtag, and it's what all the participants use to connect with each other and share their reading updates. If you need to talk to Amanda or Kelly, use @boutofbooks. If you want to connect with other participants or keep people updated about your progress, use #boutofbooks. You'll often see us reminding everyone to use #boutofbooks instead of @boutofbooks. This is so actual questions don't get lost in the shuffle of general updates. To give everyone an idea of what can be done or has been done with challenges, below you will find a list and explanation of previous Bout of Books challenges. The most successful challenges are ones that are not limited to a specific genre and include as many people as possible. Please note: We are no longer accepting "Guess the cover" style challenges for the read-a-thons. take a picture of your current TBR pile. pick one of your favorite books/series and cast the characters using pictures of whomever you think best fits the character. choose a book and give it a new name. share an embarrassing/shocking/funny story or answer this/that questions.